When the temperature drops, it’s a good idea to bring out the big guns when it comes to skincare. And if you’ve got skin that’s on the dry side all year round, boost yourself up with some serious serums and a nourishing foundation to keep your largest organ looking and feeling as hydrated as possible. It’s always a good idea to track down a richer, heavier cleanser when the temperature plummets, it can definitely help address the dryness that comes with the cooler air and when used correctly can make a real difference to your skin’s health and wellbeing. With that in mind, I would like to give a shout out to Plantae’s gentle yet effective Pacific Blue Lavender Rich Cream Cleanser. I’ve used several of the New Zealand skincare company’s products in the past and have loved them, and like the rest of their collection the entirely plant based cleanser includes only the finest natural extracts packed full of phytonutrients, to deliver healthy, great skin. And although it may be filled with goodness, it is also grunty enough so that it melts away all traces of face and eye make-up, even stubborn mascara. Suitable for those with dry or damaged skin in particular, it includes a bounty of natural ingredients rich in antioxidants to rejuvenate dry, tired, or dehydrated skin and repair skin damaged by the stresses of daily life. New Zealand Pacific Blue True Lavender essential oil, Auvergne Pine Bark and Blackcurrant Leaf Complex make it smell like pure heaven, while softening Shea Butter and cold pressed Sunflower Seed Oil condition even super dry skin and help makeup and impurities melt away. As well as this beauty, Plantae has created a new ‘Extra Love’ range, which is designed to let you know what products to select to give your skin a little bit of tender loving care when it needs it the most. In this group is their Sea Buckthorn Berry Night Cream, which is suitable for all skin types. It maximises the skin’s ‘radiance potential’, reducing the signs of damage and ageing and making skin look and feel it’s very best. Sea Buckthorn Berry Night Cream has even been scientifically shown to boost fibroblast production by an amazing 272 per cent, promoting the production of collagen and elastin production and helping with the skin’s natural repair process. 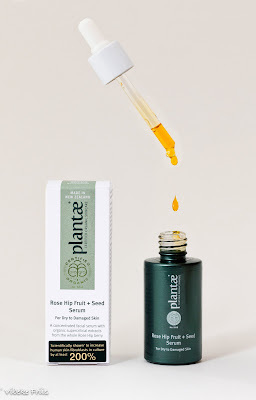 My pick from this bunch though is Plantae Rosehip Fruit and Seed Serum (above), which is a joy to use all year round. The nourishing yet non-greasy serum increases overall skin health and provides an easy to absorb source of vitamins A, B, C and E, also increasing fibroblast production by 272 per cent. Plantae believes in a holistic approach to skincare, and that when you unnecessarily break down botanical and plant extracts they lose their full potency and their true ability to treat skin to its fullest extent. Which is why this baby includes both the Rosehip fruit and the seed extract – making the formula more potently efficacious. Suited to drier skin types for use daily or those looking for an extra hydration boost once or twice weekly, it is super soothing, nourishing and just damn gorgeous to use. If you haven’t discovered it yet then I highly recommend that you do.